As the Kingdom of Thailand is one of the most visited countries in South East Asia, it’s quite hard to find a lonely beach spot, just like the one we all might know from the Di Caprio movie The Beach: with a tiny and picturesque bay, silky soft, white sand as far as the eye can see and coconut palm trees hanging their heads over the bay. But on my last trip to the land of smiles, I actually found a spot, that is pretty close to what you might have in mind right now. It’s name is Ton Sai Beach (จังหวัด กระบี่). I’ll leak the point before you read on: no, it’s not a lonely beach and there is not gonna be young Leo jumping out of the jungle to scar you and convince you of taking fancy drugs. (Well, actually, that might happen. Even though it will probably not be DiCaprio.) But I swear, everything else is just like it is supposed to be. What is Ton Sai Beach? 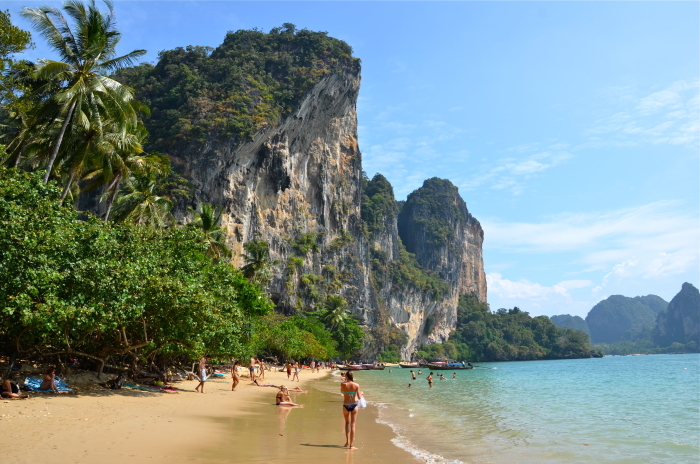 Ton Sai Beach is a beach (well, obviously) close to the southern Thai town of Krabi, that comes up with a small bay surrounded by steep rock walls that are a climbing enthusiasts’ dream. So most of all, people come here for two things: climbing and chilling. It’s pretty sandy. Ok now, seriously, it’s stunning. 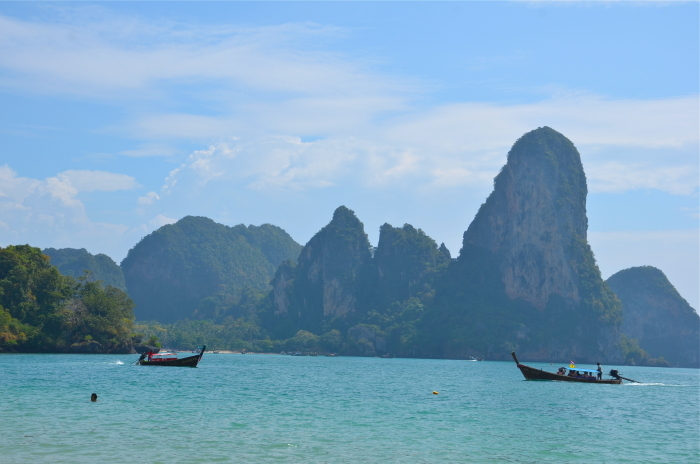 Gentle lapping, glistening turquoise water, bright sand, huge palm trees everywhere, long-tail boats lying in the bay. There is not much more that you could ask for. Be aware, due to the strong sun, the shade sites are in great demand. Well, climbing and climbing. And than chill at the beach and chill even more. And then begin all over again. And when the sun sets at the horizon, have a cold beer or a fancy cocktail at one of the beach bars. The beach boys that are all around the place will be ready to entertain you with their impressive fire tricks, that mostly consist of these totally well trained, well-tanned and probably also well-stoned young men throwing sticks in the air that are on fire. Seriously, Ton Sai could well be the world capitol for fire tricks. Wow, you have kids? Congratulations! …Yes and no. Because it pretty much depends on low and high tide. At some times, the water is pretty steeply sloping. At others, it’s very suitable for swimming, even for children. The only way to get around Ton Sai is on foot. The beach and the main road act as the primary thoroughfares in the area. But be sure, it won’t take you more than a couple of minutes to walk from one end of the bay to the other. Are there shops, bars and restaurants? 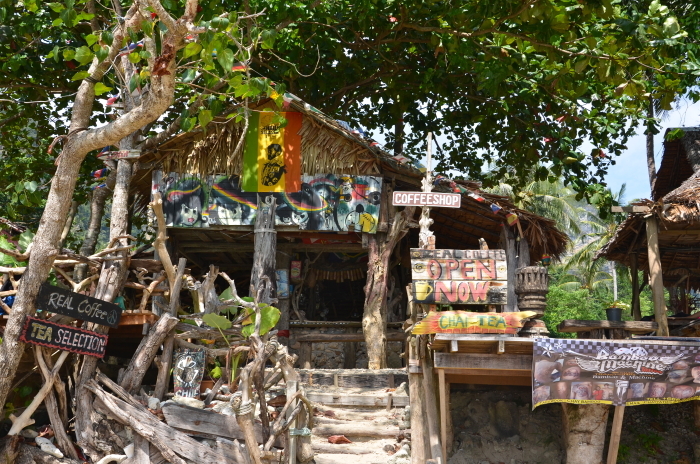 Yes, there is one beach bar after the next and each looks even more relaxed and has an even bigger Jamaican flag hanging somewhere (besides the Thai flag of course). So you are spoilt for choice. 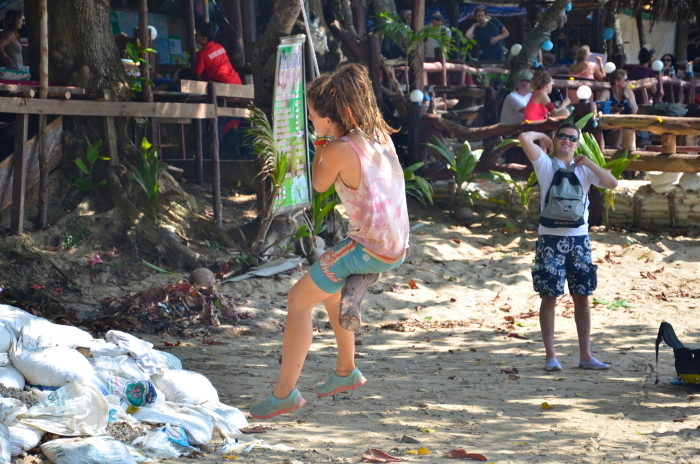 Well, there are lot’s of people with a true backpacker look and loads of people with a rastafari style. And as everywhere in SEA, there are some few that look more like they would be on an everlasting trip of the other type. If you know what I mean… What they do all day? Just hang around, you know. Can I learn how to climb? 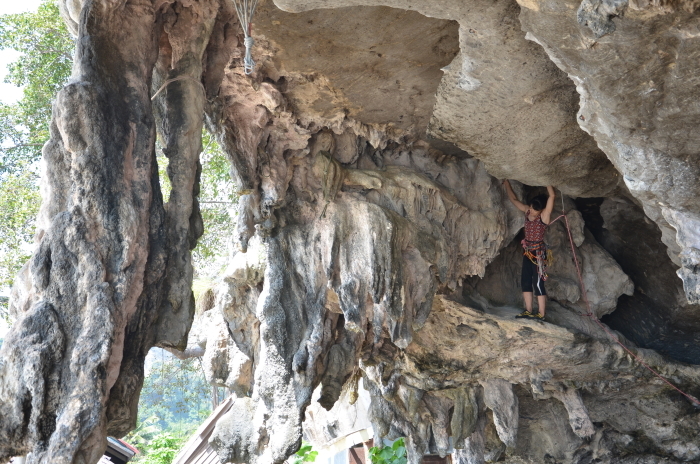 Yes, the bay is hosting a number of climbing schools and guiding companies. Yes you can! 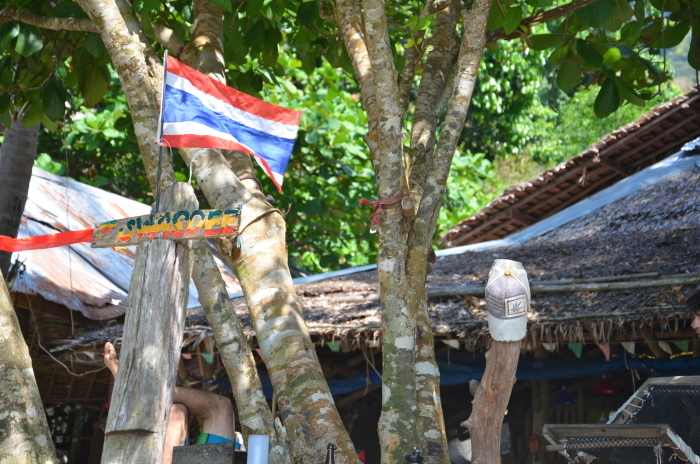 In a handful of hostels and backpacker stays that all call themselves “resort” (just like everywhere else in Thailand. It seems like the whole country is one huge resort.) Nevertheless, they should be pretty ok and price worthy in relation to most other accommodations in that area of Thailand. 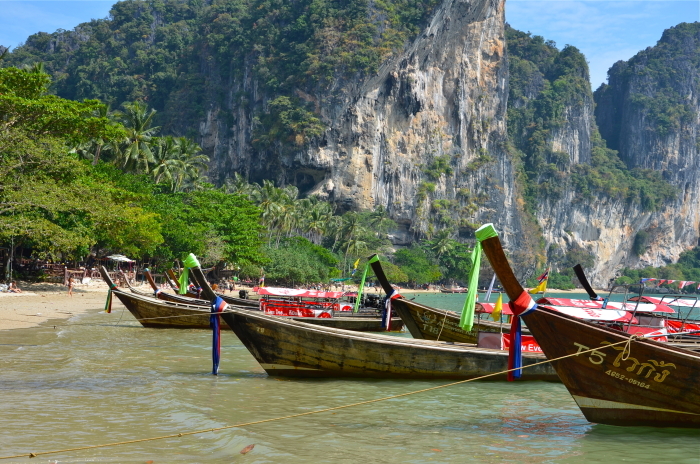 There’s no easy overland access to Ton Sai, so most visitors arrive by long-tail boat, which is very scenic! 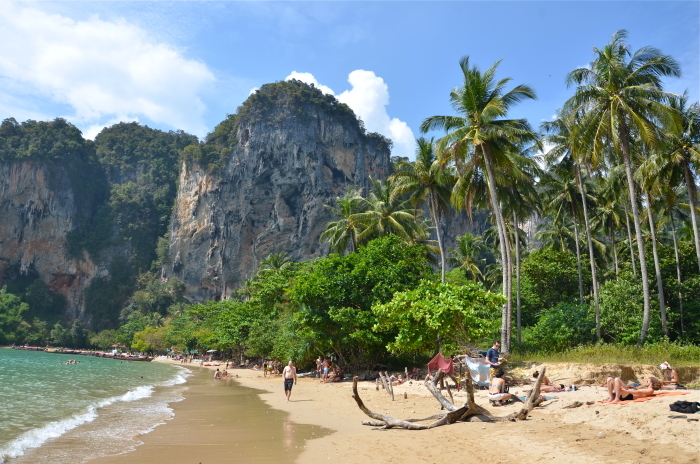 If you’re arriving from Krabi bus station, the best idea is to get a tuk-tuk or taxi to Ao Nang Pier (around 60 Baht). From there, share or charter a boat to Ton Sai (100 Baht, 10 minutes). Boats run frequently, but only when enough people have gathered and when there are at least 8 persons. It will depend on the time of the year, weather you will have to wait 5 minutes or an hour. The other idea is: make a deal with the boatman. Money and a good talk make the world go round, you know. From the other side, Ao Nam Pier, a long-tail boat is 50 Baht, with a travel time of about 5-7 minutes. Ton Sai on not a lonely beach, but a pretty nice bay to hang around and just have a good time lying at the beach or hanging at a rock. So if you fancy one of those options, this could be your dream location. 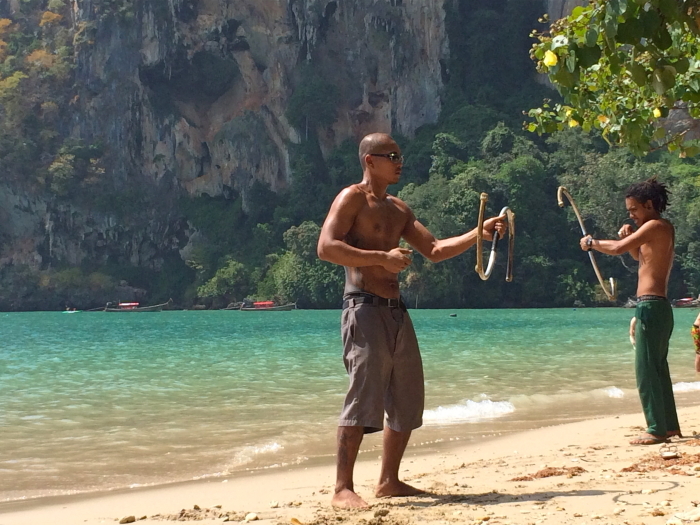 Warst du mal in Ton Sai Beach? Welche Tipps und Anekdotiques hast du von dort? Schreib einen Kommentar! Wow, it looks just amazing. I love Thailand so much. Greetings from Zurich! It absolutely is! You should check it out on your next trip! Wunderschön! Ich liebe diese Ecke Thailands. Manchmal sollte man allerdings kein zweites oder gar drittes Mal zurückkehren. Ich war 1997 das erste Mal da und es war paradiesisch. Mittlerweile ist mir das alles etwas zu überlaufen. Trotzdem…traumhafte Bilder. Please beam me up. Oh 1997 muss es toll gewesen sein! Ja, das ist leider in den meisten Ecken in Südoastasiens so, das immer mehr los ist. Auf den Gilis bei Lombok war ich 2003 mit ungefähr 10 anderen Menschen auf der Insel. Jetzt rennen sie alle hin, in Scharen. Dabei ist das gar nicht schlimm. Es ist nur gut zu wissen, es auch mal anders erlebt zu haben. I love this post. It makes me want to go back. I never should have left. Maybe I should make another trip. 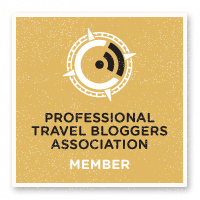 I am definitely adding you to my blogroll. Thank you so much, Albert. I don’t have a blogroll yet, but it’s in the planning. What a beautiful place…I’d love to visit there someday…at least for now I can drift off and dream with your gorgeous pictures. Thank you. Wow Samantha, that’s like the greatest thing someone can say to me. I hope you had a great dream-stopover! Thanks Rashad! 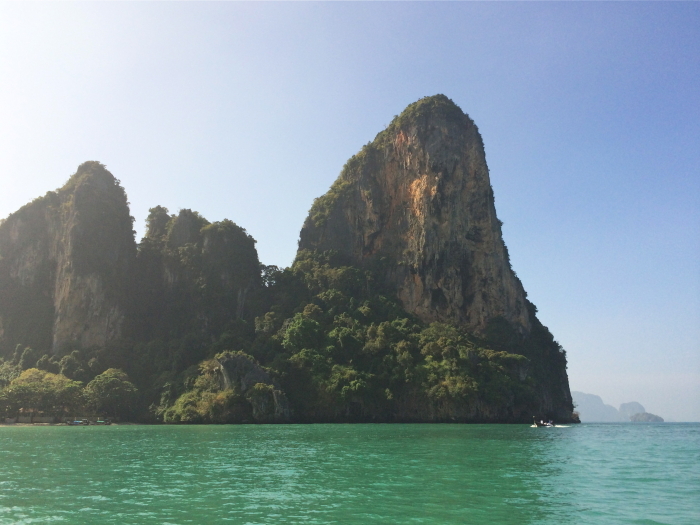 You should definitely visit Railay Beach as well, it’s on the other side of the bay and you can get from there easily to Tonsai Beach by longtail boat.